Kim Campbell served as Canada’s nineteenth and first female Prime Minister in 1993. She previously held cabinet portfolios as Minister of State for Indian Affairs and Northern Development, Minister of Justice and Attorney General, and Minister of National Defence and Minister of Veterans’ Affairs. She was the first woman to hold the Justice and Defence portfolios, and the first woman to be Defence Minister of a NATO country. Ms. Campbell participated in major international meetings including the Commonwealth, NATO, the G-7 Summit and the United Nations General Assembly. 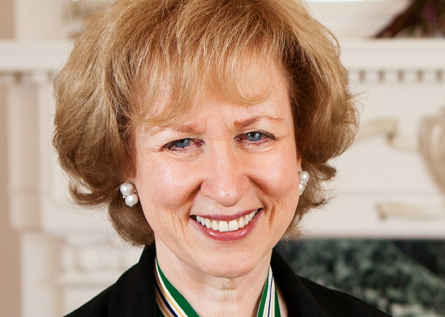 After her tenure as Prime Minister, Campbell was a Fellow at the Institute of Politics (Spring 1994) and the Joan Shorenstein Center for the Study of Press and Politics (1994-1995) at the Harvard Kennedy School of Government. She served as the Canadian Consul General in Los Angeles (1996-2000), then returned to Harvard to teach at the Center for Public Leadership at the Kennedy School (2001- 2004). Today, Ms. Campbell does consulting in the areas of governance and leadership, and chairs the steering committee for the World Movement for Democracy. She is a Trustee of the International Center for the Study of Radicalisation and Political Violence (ICSR) at King’s College London. She is a member of the Forum of Federations based in Ottawa, and serves on advisory boards of several international organizations such as the Arab Democracy Foundation in Doha and the Middle Powers Initiative (MPI). Ms. Campbell is a member of the Pacific Council on International Policy, (the West Coast affiliate of the Council on Foreign Relations) and the Global Council of the Asia Society of New York. She is also a Senior Advisor to the Crisis Group and an honorary board member of the Climate Action Reserve. Ms. Campbell ´s corporate director experience includes the high tech, bio-tech and medical devices industries. She is also a founding member of the board of the Women’s Leadership Fund, an investment fund based in Zurich.